Naples, 21th November 2018 ?" Grimaldi Lines was awarded as Ro-Ro Line of the Year last 15th November during the 2018 Global Freight Awards, held at the Royal Lancaster London Hotel. The yearly event organized by the freight publication Lloyd’s Loading List is conceived as a showcase for the best companies in the freight industry to highlight their value to the wider business world and the communities they serve. This year’s ceremony was attended by the top management and staff from major shipping companies, forwarding agents, logistics and transport companies, along with their clients and other guests. The Ro-Ro Line of the Year was one of the prestigious Readers’ Vote Awards assigned during the ceremony. Every year Lloyd’s Loading List asks its readership of freight forwarders and shippers to nominate and vote for the transport operators they feel have provided the best service over the previous 12 months. Winning a Readers’ Vote Award is therefore, in the words of the Global Freight Awards organizers, the highest accolade any transport operator can win - an independent validation of a company’s excellence. Grimaldi Lines has been presented with this prestigious award for the second year in a row; this had never happened before to any other shipping company. The award was collected by Roy Postlethwaite, Managing Director of Grimaldi Agencies UK Ltd.
“We are honoured to have received, once again, this prestigious award which proves the high quality of transport and logistics solutions that our Group offers to its customers through a modern and environmentally friendly fleet”, stated Gianluca Grimaldi, President of the Grimaldi Group. In the last few years, the Grimaldi Group has further expanded its maritime services to provide worldwide logistics with a strong maritime base. In pursuit of its mission to satisfy its international clientele by continuing to offer high quality services, the Group deploys Ro/Ro-Multipurpose Container Carriers, Car Carriers, Pure Car and Truck Carriers, Ro/Ro-Multipurpose vessels and ferries with high flexible load compositions in the Atlantic, Mediterranean, North and Baltic Seas. All of this allows Grimaldi to offer its customers door-to-door transport services, straight from the factory to the final destination. The hallmarks of its services are high frequency maritime links, strict quality standards in terms of punctuality and procedures, and compliance with its zero damage level target. The resulting performance has won acclaim from the market at large, while customers such as Fiat Chrysler Automobiles, Ford Motor Company and General Motors have rewarded the Group for the quality of its services on numerous occasions. 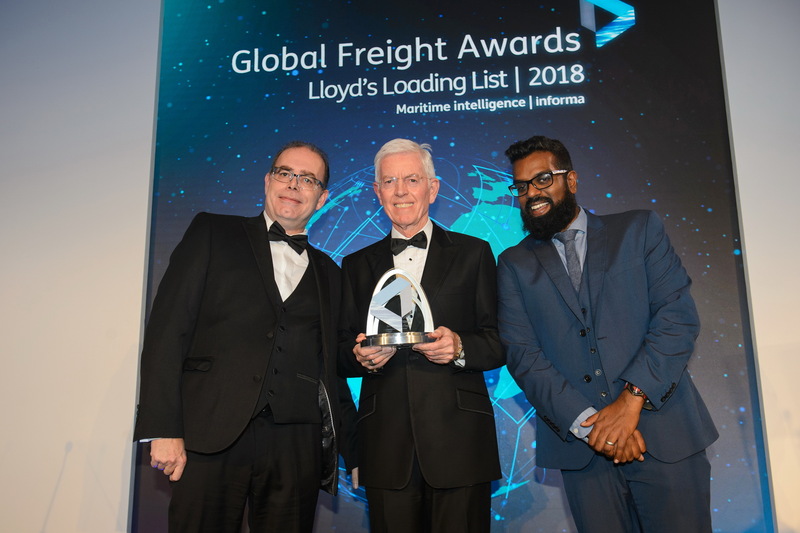 In the photo from left to right: Scott Reeves, Managing Director of NMT International Shipping Ltd., Roy Postlethwaite, Managing Director of Grimaldi Agencies UK Ltd., Romesh Ranganathan, comedian, actor and compere for the 2018 Global Freight Awards.